"Once upon a time, there was a magic road .... "
The Spanish and, later, Mexican governments encouraged settlement of territory now known as California by the establishment of large land grants called ranchos, from which the English word ranch is derived. Their workers included Californian Native Americans. Of the 800-plus grants, Spain made about 30 between 1784 and 1821. The remainder were granted by Mexico between 1833 and 1846. The ranchos established land-use patterns that are recognizable in the California of today. Rancho boundaries became the basis for California's land survey system, and can still be found on modern maps and land titles. Visitors to El Camino's trails in Southern Arizona are often struck by vast mountain ranges rising suddenly out of the desert lowlands. Prickly pear and ocotillo rapidly give way to oak, pine forest, and a much cooler climate. Usually 6,000–8,000 feet in elevation, these majestic hills emerge from a sea of desert scrub and provide an oasis for an abundance of wildlife. 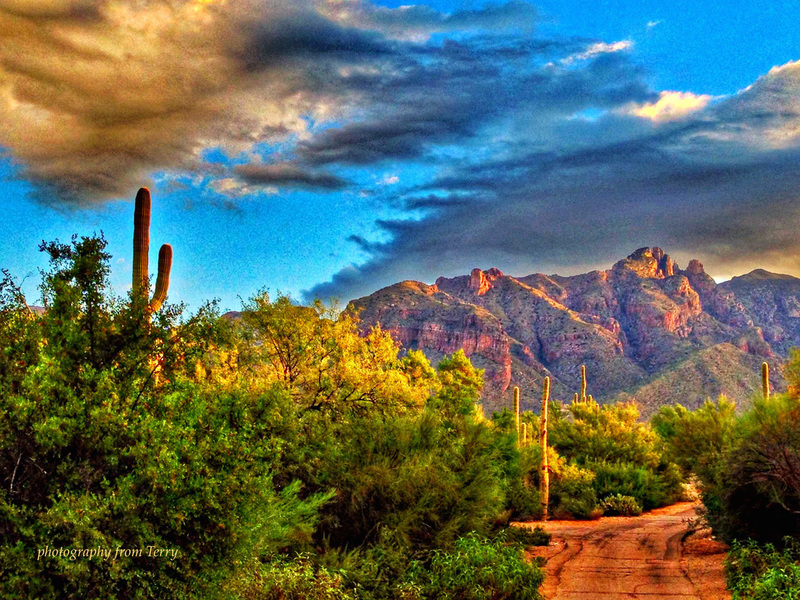 Known as Sky Islands, these areas encompass most of Arizona’s biotic communities. Many of Arizona’s most beloved creatures are found here, including the mountain lion (cougar) the Mexican Spotted Owl, and other raptors. 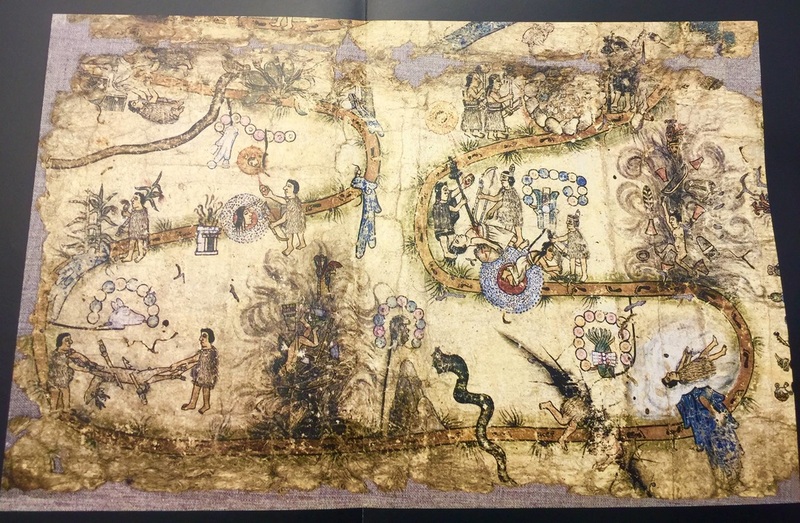 When Camino Arts founders Benjamin Juárez Echenique and Marisa Canales embarked on a journey to record the ancient music of Puebla, their path led them to this enchanted place. Here they encountered a 16th century monastery situated in the mountains (the eagles nest). The monastery is named after St. John the Baptist (San Juan Baptista) and so beautiful that Benjamin and Marisa decided to record their project in this sacred space. During the recording session, the sound of an unusual instrument permeated the hall - the bird song of a family of wrens. If you listen carefully to this recording, you will hear their voices intermingled with the music. In 1913, Mexican composer Manuel Ponce created a folksong masterpiece entitled "A la orilla de un palmar." Known as the creator of the modern Mexican song, Ponce's harmonies and romantic melody in this classic tell the story of a little orphan girl who lives by the sea. The idea of preserving California's El Camino Real was first proposed by Miss Anna Pitcher, Director of the Pasadena Art Exhibition Association to the Women's Club of Los Angeles in 1892. The factors driving the preservation were, first, the rise of the automobile, which created a small but influential group of wealthy Californians who clamored for a well-maintained state highway. The second factor was a reinterpretation of Spanish colonial California as a romantic paradise, fueled by the 1884 publication of Helen Hunt Jackson's "Ramona" and set within a broader cultural embrace of Southern California as a American Mediterranean retreat. In 1904, a group was formed called the El Camino Real Association. This group had the mission to mark the historical route, promote tourism along the road, and lobby for government support. 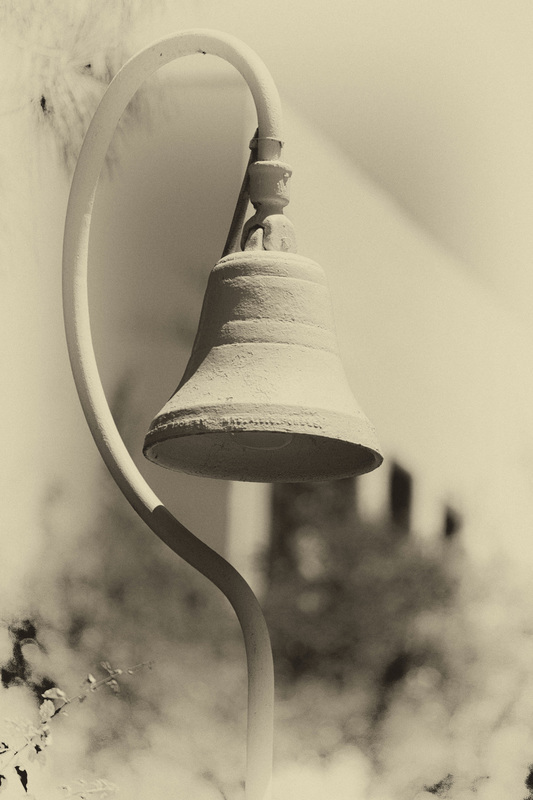 A cast iron bell was created for this purpose, placed in 1906 in front of the Old Plaza Church in downtown Los Angeles. By 1915 about 158 bells were installed along the Camino Real. The town of Puebla, Mexico might be called the modern birth place of the route we call El Camino Real. Here, Mexico's musical heritage was invented, a musical tradition which blends the cadence of indigenous and Spanish colonial rhythms The cathedral at Puebla has a distinguished musical ancestry dating back to the 15th century, when Spanish chapel masters brought the music and instruments of Spain to the new world. It also has the tallest cathedral towers in Mexico, one of which has no bells. According to legend, an underground river passes under that tower and if bells were placed in it, the tower would collapse. 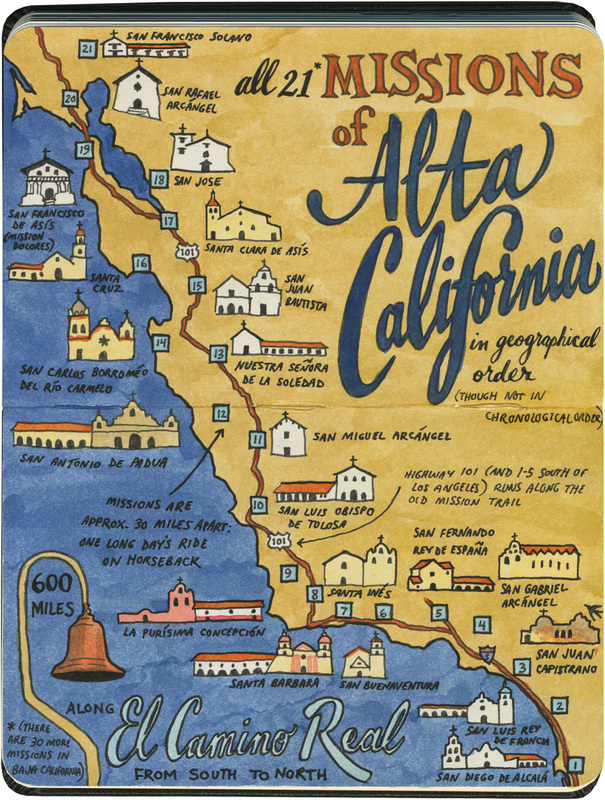 The story of El Camino's trail - the path walked and experienced by the first and current settlers of this ancient road - might be heard by experiencing the actual road. Have you ever imagined what it might be like to walk in the footsteps of history adventure? Now you can. This link will take you to information on how to hike the length of El Camino Real in California. Happy trails! 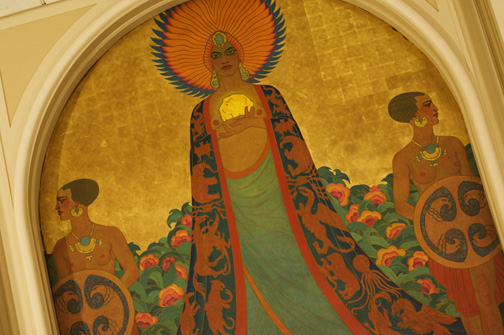 Do you know the story of Queen Calafia? Her kingdom was made of gold, and she rode a magical griffin throughout her empire. The name of this mystical land: California. As retold by author and attorney Robert Petersen, the legend of Queen Califia was from a 16th Century romance novel written by a Spanish author named Garcia Ordonez de Montalvo. It was titled, "Las Sergas del muy esforzado caballero Esplandian, hijo del excelente rey Amadis de Gaula," meaning "The exploits of the very powerful cavalier Esplandian, son of the excellent king Amadis of Gaul. "The novel described an island, very close to the Garden of Eden, full of gold, which was ruled by strong and beautiful black women. This island was also populated by griffins, a fantastical lion-eagle hybrid, which the women kept as pets. Any man who found his way onto this island was killed and fed to the griffins. Read more about the origins of El Camino's northern territory by reading Mr. Peterson's essay here.